Twitter isn't making friends with its recent move to force developers to work more closely with the 140-character message-sharing site, nor its decision to ditch LinkedIn earlier this summer. Among those who don't appreciate what Twitter's done on the developer end is Reid Hoffman, co-founder and executive chairman of LinkedIn. Speaking at the TechCrunch Disrupt technology conference Monday, Hoffman called Twitter's new API policies "partial B.S.," though the entrepreneur, who's also a Facebook investor, said he understood Twitter's perspective. "It's not fair to the developers because many of them based their livelihood and product strategy on it," he said. "However, Twitter has a responsibility to its vision and its shareholders." 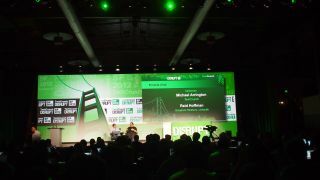 Moderator Michael Arrington of TechCrunch tried to coax Hoffman into calling Twitter's developers policy "total B.S.," but Hoffman wouldn't bite. Arrington also brought up Twitter's June dumping of LinkedIn as it attempted to gain greater control over the platforms that carried its branded messaging. "Twitter really screwed you guys over," he said. "What did you say around the office? You didn't call it, 'partial B.S.'" Hoffman admitted his company was "alarmed" by Twitter pulling out of LinkedIn, saying the site liked the "liquidity" of status updates Twitter offered. However, Hoffman and crew were "very pleasantly surprised" that despite losing the constant stream of user generated content, LinkedIn got better once Twitter flew the coop. "It was better for LinkedIn because it eliminated the noise," Hoffman said. "LinkedIn was able to have business-focused conversation again. "People don't go on their LinkedIn to see, 'The fish is really good at restaurant X.'" Although tweets no longer show up on LinkedIn profiles, users can still tweet out, something Hoffman said is part of the social media milieu, with or without a Twitter partnership.